Technology is incredible. If you had told any of the spotty kids who spent their pocket money in the arcade every weekend that there would come a time when those cabinets that regularly foiled them would one day be shrunk down into the palm of your hand, they probably wouldn’t have believed. That’s exactly what this duo of mini-cabinets (or “micro players” as they are officially dubbed) from My Arcade are: a condensed version of the scourge of the arcade. While they obviously can’t be as impressive as their standing counterparts, there’s something very cool about being able to replicate that arcade feeling from your couch. There’s one game per micro player with me getting my hands on Pac-Man and Galaga. The latter, in my opinion, is not that great in current times, it being just a little too frenetic for use on such a small piece of kit, though those who remember aiming for the leaderboards will no doubt relish the opportunity to try so again. Pac-Man, meanwhile, is as great as it has been for decades and is still madcap fun no matter the size. In terms of the fidelity, there are some concessions when playing on a tiny 2.75” screen, but the older nature of the games themselves mean that you see everything you need. The audio quality is also surprisingly crisp despite the micro player being just 6.75 inches tall, though the added option to use headphones may be the best way forward with simple buttons either side of the input to control the volume. While it’s probably the main hook of the units, the small size of the micro players does sometimes make them slightly uncomfortable to hold, especially with the “rough” edges to the side of the buttons. You shouldn’t expect absolute precision, either — this feels more like a novelty item than something you could use to take the eSports scene by storm. There’s nothing wrong with novelty, however, as these micro players will no doubt be appreciated by any retroheads out there all the same. You can even remove the joystick to simply have the directional pad if you so wish. The micro players can either be powered by AA batteries (that they sadly do not come with) or through a micro USB cable, which should be around the house for anyone who has a modern phone. The latter is a really nice touch that can provide unlimited play, but batteries can also last the distance. It’s difficult to envisage these being something that you would or even should play for many hours without interruption, but the option is there. 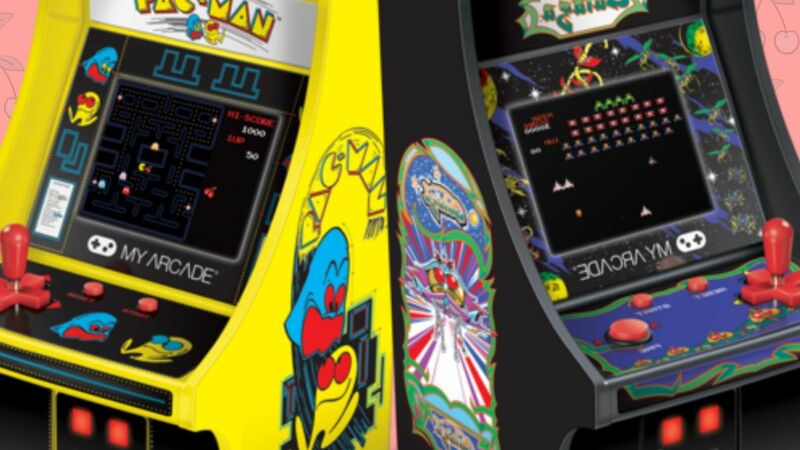 Despite being a little uncomfortable for extended periods of play, the My Arcade micro players succeed in providing what they were produced for: slices of retro gaming that will look great in any collector’s room. If you know anyone with a passion for the days of gaming yore, this could be a good option for them this Christmas.